WTI crude prices have jumped to the neighborhood of $49.50/b this morning. Last week, prices surged on Wednesday and stabilized on Thursday and Friday. WTI opened at $47.85/b today, an increase of $0.04, or 0.08%, above Friday’s opening price. 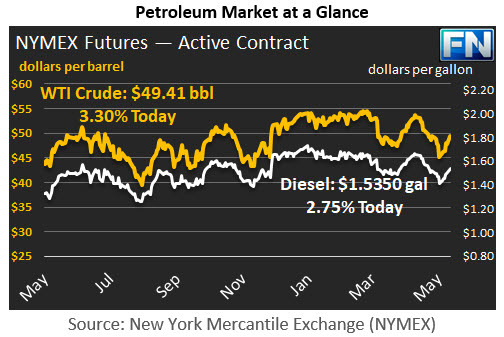 Current WTI prices are $49.41/b, a major jump of $1.57 from Friday’s closing price. Product prices also have surged this morning. Diesel opened at $1.4933/gallon in today’s trading session. This was an increase of 0.33 cents (0.22%) above Friday’s opening price. Current prices are $1.535/gallon, up by 4.17 cents from Friday’s closing price. Gasoline prices opened today at $1.5785/gallon, an increase of 0.73%, or 1.15 cents, above Friday’s opening price. Prices are $1.6137/gallon currently, up 3.76 cents from Friday’s close. 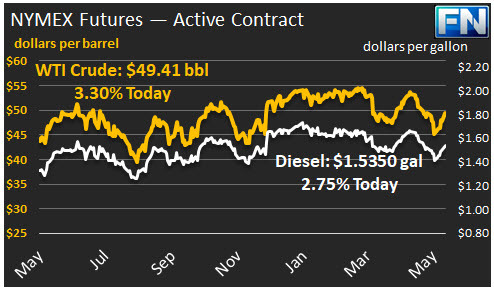 Following the mid-week price surge last week, crude and product prices traded in a narrow range, managing to recoup some of the recent price declines. For example, Friday’s market opened at $47.81/b and closed at $47.84/b, a difference of only three cents. WTI crude ended the week $1.49/b in the black. Diesel ended the week 4.68 cents/gallon in the black. Gasoline ended the week 6.96 cents/gallon in the black. The recovery in prices began upon the release of the Energy Information Administration (EIA) weekly supply data, which reported across-the-board inventory drawdowns. The market held to gains based on increasingly strong statements from OPEC regarding an extension of the oil production cuts. This morning, prices jumped again following a press briefing in Beijing held by Saudi Arabian Oil Minister Khalid Al-Falih and Russian Energy Alexander Novak. The market has been growing increasingly confident that an extension to the cuts would be accepted. Today’s announcement greatly elevated confidence when the Saudi Minister stated that the group was contemplating an extension of nine more months rather than six.